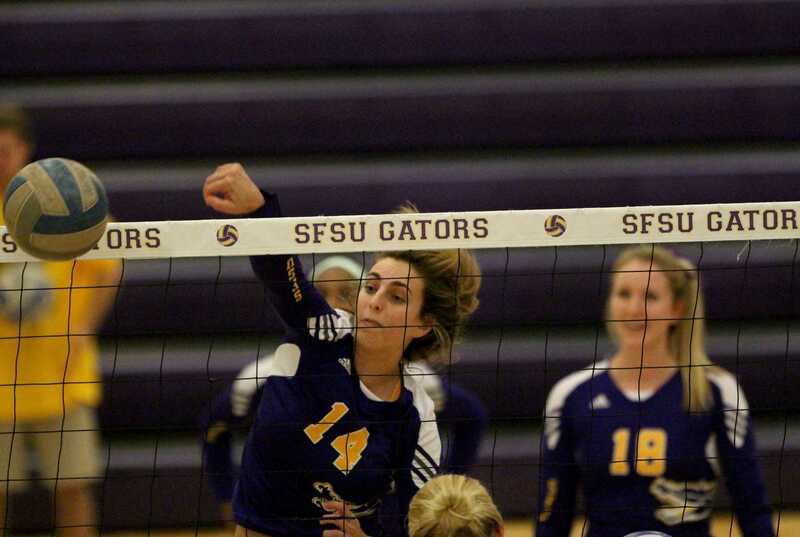 SF State ended their home stand with 3-1 set loss to No. 19th ranked UC San Diego, bringing the Gators record over the last four games to 2-2. SF State showed signs of fatigue from the previous night, coming out sluggish in the first set. The Gators fell behind 10-15 early, and couldn’t gain momentum. The team battled back, but came up short losing the set 25-19. In the second set, the Gators came alive and fought off a Triton comeback edging out UC San Diego 25-21. Bria Morgan of the San Francisco State Gators prepares to spike back the ball during a match against the Cal Poly Pomona Broncos. The Gators won the match 3-2 Friday, Sept. 26, 2014. Martin Bustamante / Xpress. Behind the energy of the home crowd, the Gators had a back and fourth third set with the Tritons, but lost the frame 29-27. “San Diego was able to steal that game from us and they carried a tone of momentum into game four and we just weren’t able to overcome that,” Muhe said. After a heartbreaking loss in the third set, the Gators ran out of steam and lost the fourth set with almost no opposition. They lost the fourth set 25-18. Clark and Bria Morgan had 18 and 16 kills respectively. Senior Jacquie Brice continues to play well with 55 assists. “We’re going to take it one match at a time, chip away at some teams and hopefully we can get that win on Wednesday against Sonoma,” senior Melissa Horton said. The Gators now face five teams in two weeks and they look to come away with wins against quality teams.